They might look like average adjustable desk lights, but the sturdy white lamps that recently appeared at the University of Waterloo are actually covert weapons in the battle against the winter blues. 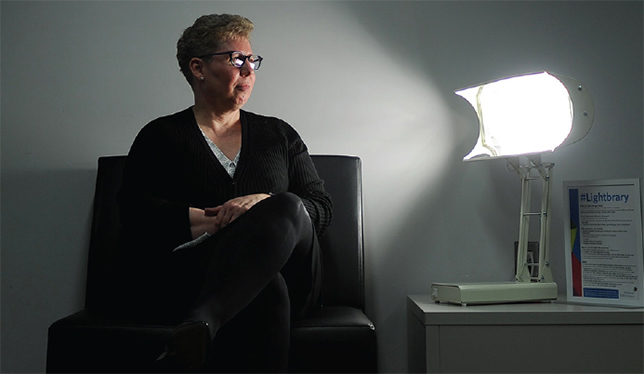 The university recently installed a pair of therapy lights in a third-floor lounge and computer workspace in the Psychology, Anthropology, Sociology Building for students and staff experiencing seasonal affective disorder. Symptoms of the disorder, known as SAD, typically emerge in late fall or early winter and recede by summertime. These include difficulty concentrating, hopelessness, changes in appetite and weight, a loss of enjoyment and energy. Since the recurring condition is linked to a lack of sunlight, some medical professionals have found bright indoor lighting a successful therapeutic intervention. Basking in intense fluorescent white light (10,000 lux, or about 100 times the strength of regular indoor lighting, is recommended) for about 30 minutes a day can help by triggering areas of the brain that produce dopamine and serotonin, and that regulate the body’s circadian rhythm (it’s 24-hour clock). Robin Mazumder, a PhD student in cognitive neuroscience, requested the lamps through the university’s Graduate Studies Endowment Fund for campus life enhancement. He was inspired by a similar project he started in Edmonton three years ago while working as an occupational therapist. “I realized how down I got during the wintertime and I just couldn’t tolerate another winter like that,” he says. After receiving a SAD diagnosis from his doctor, Mr. Mazumder says he “researched the hell out of” therapy lights and found that the most effective units tended to run from $200 to $300. With funding from Edmonton’s Awesome Foundation, Mr. Mazumder collaborated with the Edmonton Public Library to install three therapy lamps in public areas around the downtown library. The idea has since caught on at libraries in Winnipeg, Whitehorse, Toronto and at the University of Alberta. This winter, Mr. Mazumder brought the light therapy program, dubbed #Lightbrary, to the Kitchener Public Library, and in late January, to UWaterloo. “For students on a grad stipend, spending $300 on a therapy light wouldn’t make much sense. And we spend a lot of time on our computers,” he says. Though the lamps aren’t a replacement for natural light, he notes that they can make a difference – and not just on the individual sufferer. After fielding several requests and questions from institutions interested in setting up their own #Lightbrary, Mr. Mazumder has created an informational website. And he recently negotiated with light therapy company Northern Light Technologies to provide community initiatives with discounted equipment.